Vanessa is a blog reader turned friend who happens to write a fabulous blog called Vanessa and Valentine. Vanessa’s taste is traditional with a twist, which I love and can definitely identify with. Her dream home is absolutely stunning! It would be located in Pacific Palisades and be traditional in style. I love this facade because I think it would be so much fun to decorate for all the seasons. 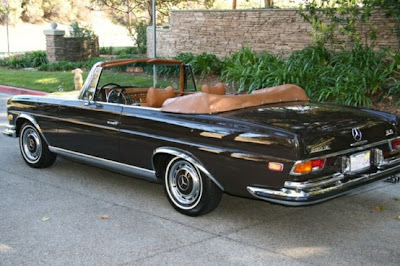 I live in Brentwood and often take drives heading west on Sunset Blvd. through the Palisades. My husband and I swear one day we will live on our favorite street called Amalfi Drive. It literally feels like you are in Italy, with the cool ocean breezes coming off the Pacific. 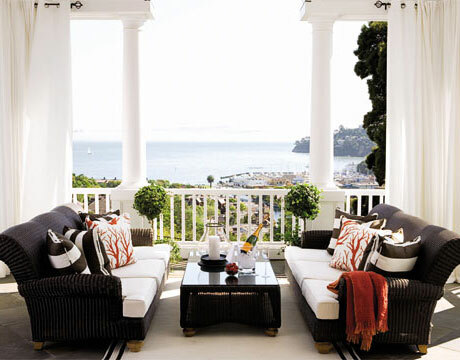 It's family oriented, beachy, yet the epitome of casual California elegance that I love. 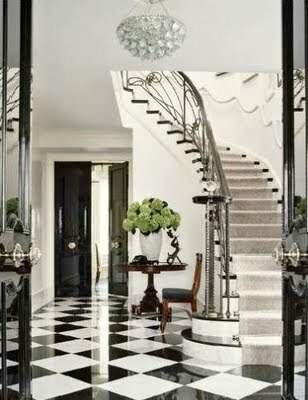 Upon opening the black front door a fabulous black and white marble checkered floor will greet you. I absolutely love the graphic combo of black and white, it's my absolute favorite! I also am really drawn to more formal spaces. It just reminds me of old Hollywood and I think in a family home, a little bit of glamour is a good thing. I want my home to feel grown up and have a big presence to those that enter it. 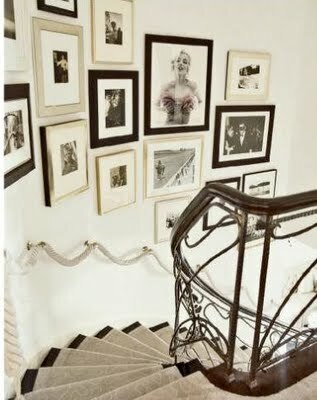 Photo wall up the staircase: check! I love black and white photography and displaying family portraits in groupings. A grand circular staircase like this has always been a dream of mine! 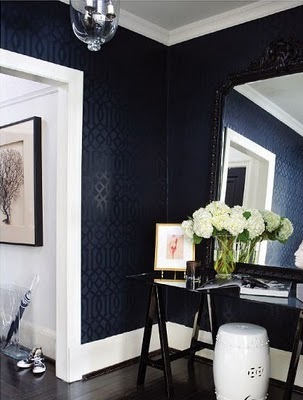 I love black wallpaper and never seem to tire of Imperial Trellis. I don't care if it's everywhere, I still love it. This is the perfect spot to drop your keys and purse when you get home. I love art books, scented candles and fresh flowers, especially white hydrangeas from the garden, my favorite flower. I dig these doors leading into the dining room! Again, I am a sucker for black and white and I love how these slide into the walls or can create privacy during loud dinner parties! 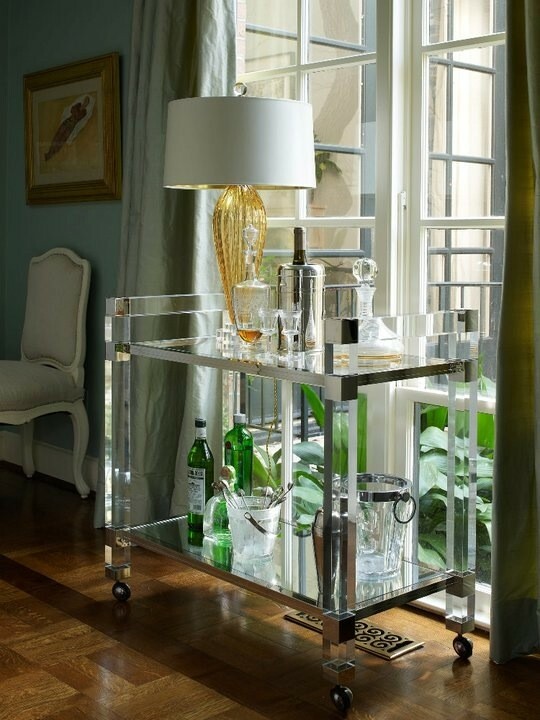 I'm the one in my circle of friends known to throw big parties and who can resist a bar cart, especially an acrylic one! I love this one from Jan Showers. I used to work at The David Sutherland Showroom, in West Hollywood, where Jan's Collection was sold, and she used to come in all the time to visit and her line was my favorite! I love how her furniture is French inspired, yet so feminine. I literally used to dream of using all her pieces in my home one day! I'm not into having "formal" rooms where you can't hangout and be comfy, but this would be the formal living room. I just love white with bold pops of color! 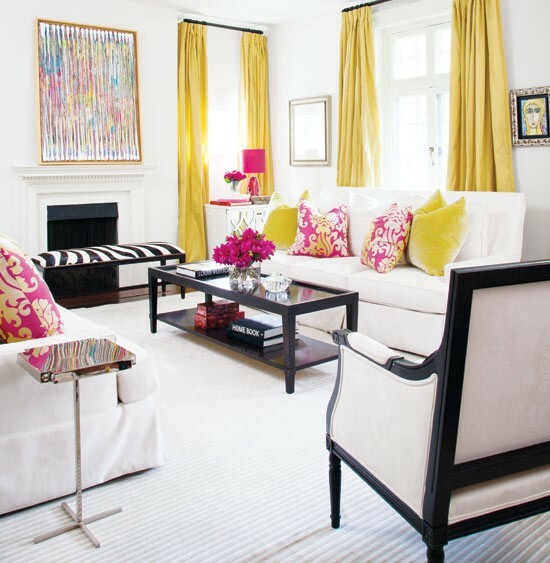 Pink and yellow make me so happy and the curtains almost look like sunshine pouring into the room! Love that! Here is the music room. I love a grand piano in a house, especially so when you throw those parties, someone can sit down and play for everyone! I also grew up playing and I hope my little one will take lessons too! 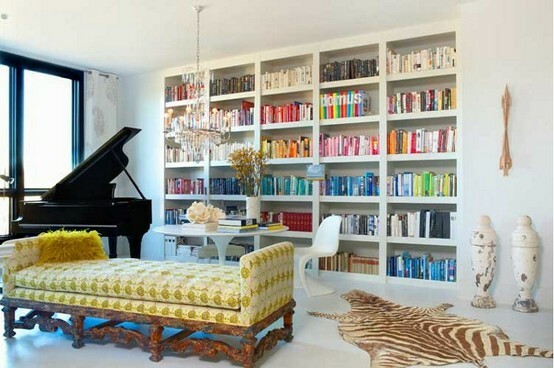 I love books and have quite the collection growing right now, so I am hoping one day to have a library like this one. The zebra skin isn't bad either, I love zebra and animal hides. This is the room to bump the music loud! Anyone who knows me, knows I love music! My Dream Home is going to have a room with turn tables set up to play vinyl records, CDs, the iPod, you name it! 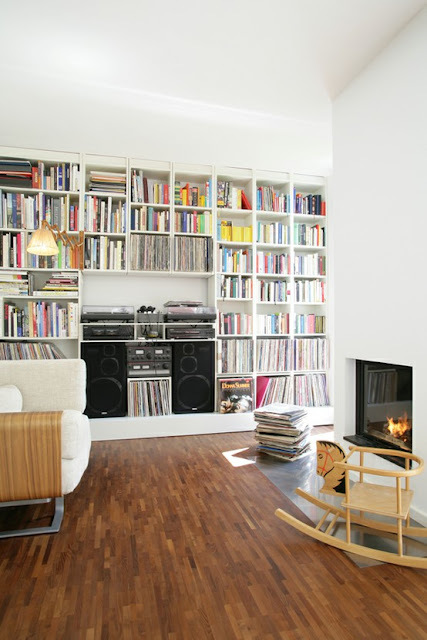 I spy a Donna Summer album in this room, which I love! I used to play my parent's Donna Summer records all the time growing up so anytime I bust out the old stuff, great memories come back to me! I love that there's a fireplace in this room. Makes me want to put on a jazz album, drink a cup of coffee, and curl up with a book. And, it's a kid friendly space with the rocking horse. Love that for the kiddies! This room just speaks to me. I love all the styles going on in here. This reminds me of my personality, a little traditional, a little bohemian, a little mad creative artist, a little preppy, a little glam! It's just perfect! This would be the formal office. I definitely love the masculine lines with the feminine touches. I am obsessed with that Louis style chair with the nail head trim and again another zebra hide! This is my studio office, where I work on design projects, wrap gifts, read magazines and just get inspired. 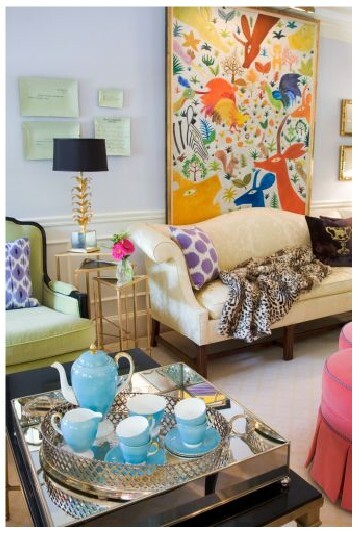 I love the colors in here, it just feel calm and relaxed, yet has a little formality that I like. I totally would want to unwind each day with a glass of wine in here. This is the breakfast nook. I have a thing for Slim Aarons and really want to own a copy of that print on the wall! 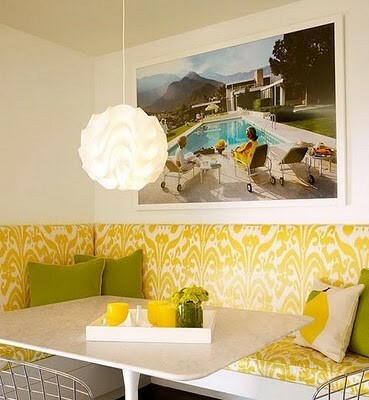 I love the yellow ikat too and a built in banquette is a must for the kids, the perfect place to enjoy our breakfast in the morning. This is so California to me! I love this kitchen. I wish there were more pics! 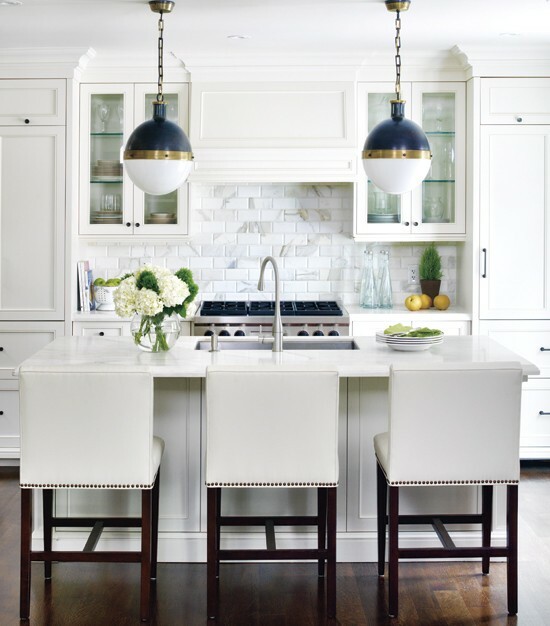 I love white marble and white cabinets and of course, those pendant lights. I love a good kitchen island for entertaining! This laundry room is pretty spectacular! 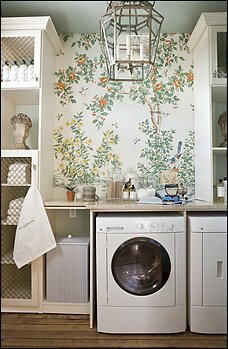 Who wouldn't want to look at a beautiful chinoiserie print while doing laundry! And I love white appliances! This would be the Master Bedroom. I love all of the elements in this room! Mirrored dressers, orange monogrammed Leontine linens, a faux fur throw, a dog painting over the bed and an accent chair! I could see the whole family lounging around in here on Sunday mornings. Those light blue walls are calming too! Here is my closet. You can't see much in there, but I had to show you the doors. 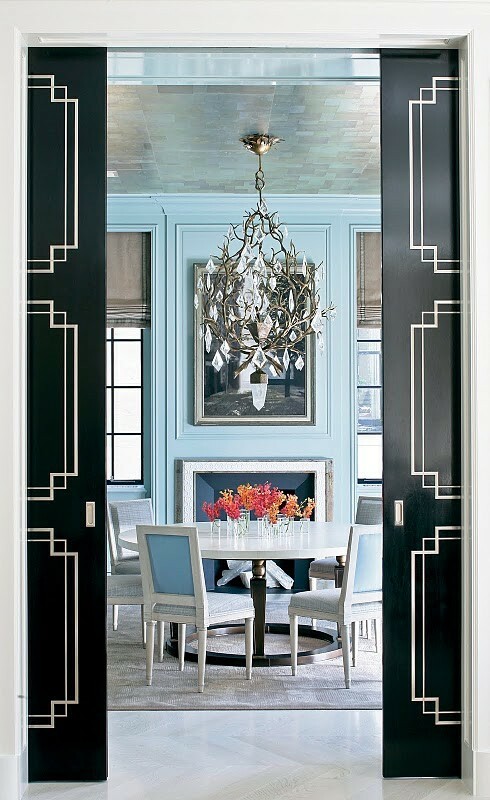 I love the black double doors and the chandelier in the closet! I could hang out here for hours! This is the Master Bathroom! It's just heavenly, don't you think??? I am so in love with this room I swear I have to create something like this for myself one day. 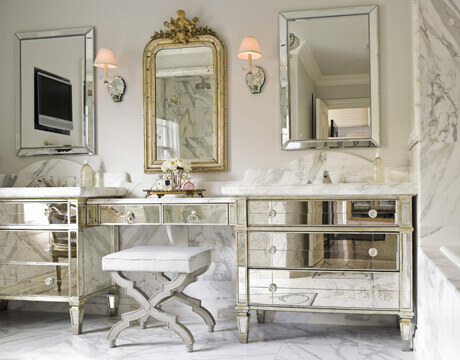 The fixtures, the marble, the mirrored vanity, I mean come on, serious? This room just takes my breath away! Here is a guest bedroom. Again, done by Jan Showers. I am obsessed with this bench and this palette of pinks and tans has me swooning! And this bathroom is the perfect complement to the guest bedroom! Pink accents and lots of white marble: done and done! Here is another guest room. Creams and whites with dark wood accents are my favorite. This room is so serene and calming. I also love any headboard that is tufted! And here is another guest bathroom! 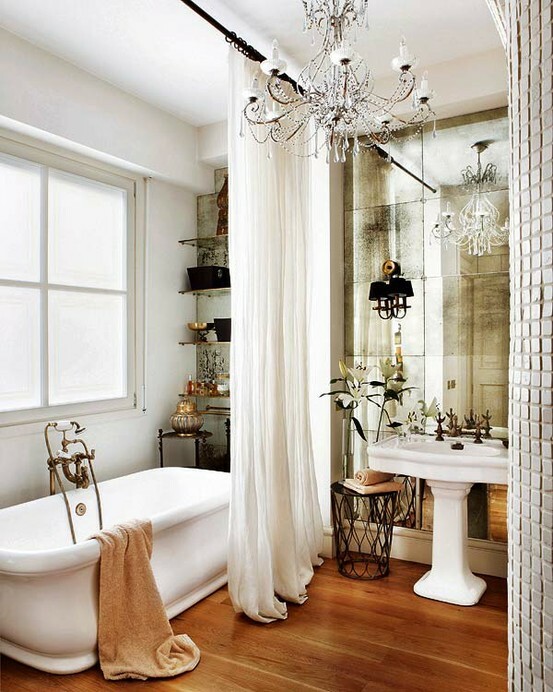 Don't you just want to soak in that tub and I am loving the antique mirror behind the sink. Flawless! I had to include a dark smoky room. 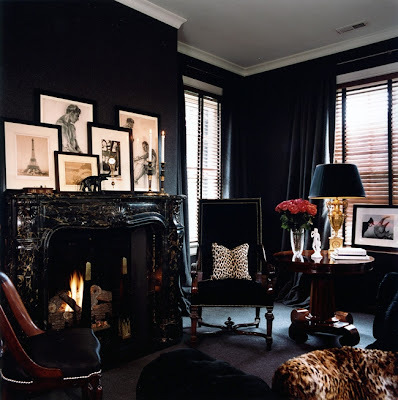 I mean seriously the black marble fireplace, black furniture, gold accents, and leopard is just insane! Here is the nursery for my little baby boy! 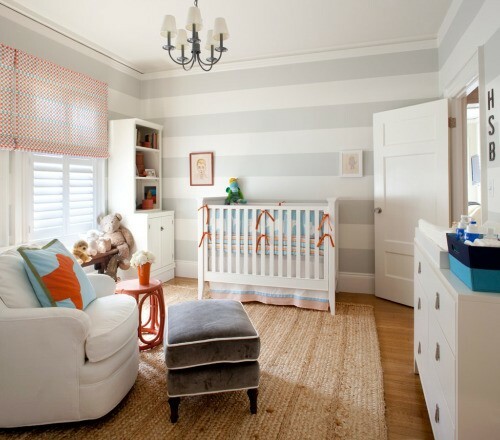 I have long been inspired by this room, with gray stripes and white furniture. I love white furniture in nurseries! This is my little girl’s room! Check out that insane rug! I can't get enough of this palette: the hot pinks, oranges, blacks! 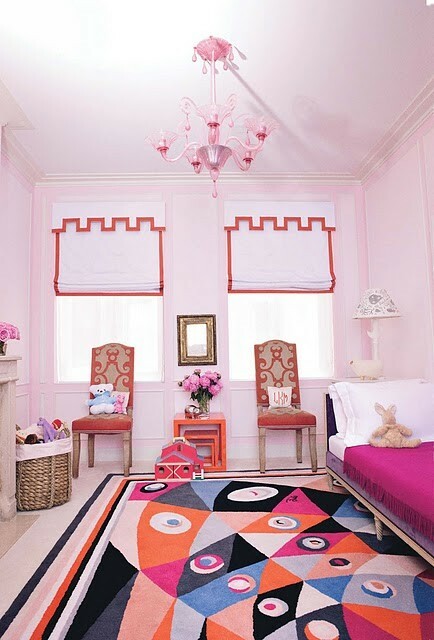 I think for a little girl, this is quite the stylish room and that rug will definitely be going to her first apartment. Here is my daughter's bathroom! 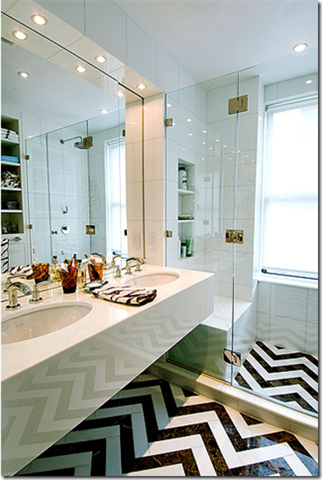 The chevron floor is beyond, love that! 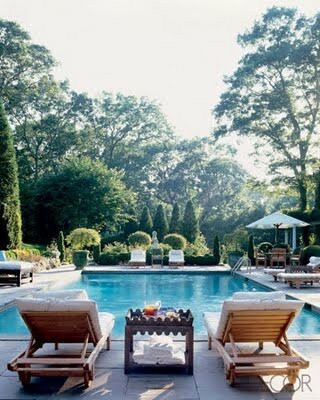 The Dream Home wouldn't be complete without an awesome pool with teak chaise lounges! This is the side veranda of the house. I want to have breakfast out here and listen to the fountains and just soak up the sun with my morning coffee! Since the house is located in the Palisades, this is the insane view to the Pacific! Again, it wouldn't be complete without lots of black and white, coral accents and of course a bottle of bubbly on ice! ...and this is my little weekend driver that I take to the beach and around town! my thoughts to the "T!" If I was next to you I would kiss you and hugh you!! 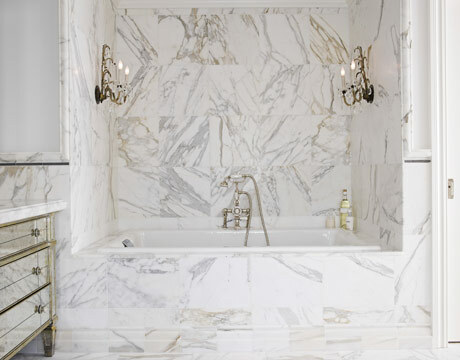 You have know idea how I love marble in the floor, the black doors, the build in banquette in the kitchen, black and white, a wonderful laundry room, mirrored dresses and vanity with marble in the bathroom... I could go on and on! Way above my dreams! This similarities are making me cry! BE HAPPY and I hope we can both have the house of our dreams one day! And keep posting about it! Paloma thank you for including me in your series, had so much fun getting lost in all this inspiration! You ladies are so kind, and it's pretty amazing when you find like minded individuals that you share something in common with . Nice to meet you all! LOVE THIS HOUSE! it is so clean and "white" but still has traditional elements. I love the pink and tan combo. thanks for sharing! Vanessa your Dream Home is very nice! I visited your blog ( and now I'm following it): I love all the photos you posted. Compliments! Congrats also to Paloma for her blog and the guests she chooses! Does anyone know who makes the kitchen pendant lights??? I have seen them everywhere but now cannot remember where! Wow...what a fabulous dream home...by far my favorite...Vanessa...you nailed every room...just the way I would love my home to look. Anon, the pendants are by Visual Comfort. They're called Hicks pendants and they come in three sizes. If you are a designer, you can buy through them. Otherwise, you can order them from CircaLighting.com. Good luck! I could move right in !! Every single room is SO gorgeous and truly the perfect dream home ! Vanessa I don't even know where to begin as each image is so perfect, so luxurious! A Dream come true! I have just pinned everything about this post!.. thought it was finished and then more eye candy coming and more and more!.. great dreamed home! marble, femininity, black and white (and creams), freshness... everything! I love the black accents, like the doors and the black and white prints in the hallway ... but what I especially love is that the home looks like the one in Father of the Bride ... everything is super elegant! I'd love to visit this home! I LOVE the Imperial Trellis! I got it from DecoratorsBest last year, the green on white, so cool! Love the dream house! Great taste! 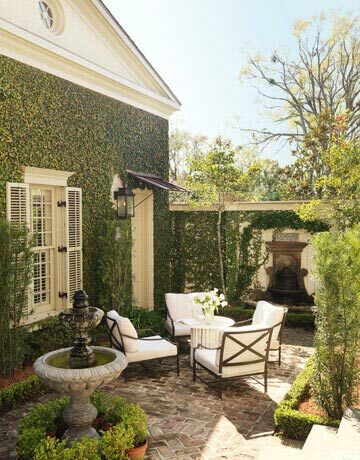 What is the source for the outdoor black wicker sofas? Saw same ones at Restoration Hardware but not the same color? My absolute fave in this whole series! Pure perfection!! Does anyone know the paint colors of the 2nd guest Bedroom with the white and cream ? Is there anyway you could email me the source of that guest bedroom with the creams and whites? I am DYING to find a tufted buckwheat colored headboard with that exact style and shape (including the wingback). I am searching online and I've found a few that resemble it but I am stuck on that headboard in that picture! Stunning!